We wanted to add a joke about 'Darth Nader', but it seemed a bit flippant. This is a ludicrously dangerous endeavor. I don’t support you doing it. I don’t even really support me doing it. 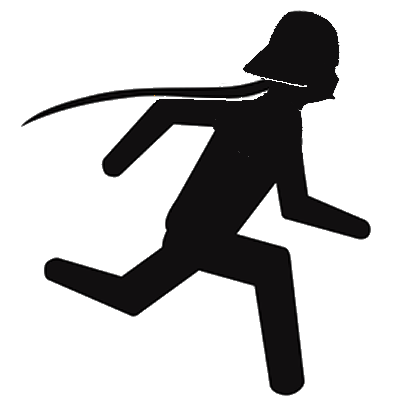 If, for the Force-alone knows what reason, you decide to do this, you do so entirely at your own risk and you agree that you fully understand the dangers inherent in running at 129 degrees in a black costume. They are myriad, and include dehydration, heatstroke, heart attack, leg-knack, really badly chapped lips, death, death, more death, and getting a purple face. I cannot be held responsible for encouraging any of that. So if you ever decide you want to try this, train properly! In all seriousness, I train all year round for this run – I spend dozens of hours in the sauna, and dozens more running in high temperatures without the costume. I’ve crewed Badwater three times, run marathons, and run in Death Valley for seventeen years. PLEASE DO NOT ATTEMPT THIS KIND OF THING UNLESS YOU ARE SERIOUSLY WELL TRAINED. In other words, I might look like an idiot, but I’m a well-prepared one. If you are going to run in extreme heat, please read THIS ARTICLE first. It might save your life. “Most people don’t stop to think about what it means when ambient temperature exceeds body temperature. Below body temp, you’re cooled in several ways: you radiate heat into the surrounding environment, air conveys heat away from you, and contact with objects conductively transfers heat away. Whether you come to run, walk, or just sit by the pool, please remember that this is a beautiful, but deadly place. I have literally run past the grave markers of people who have dropped dead from heat exhaustion here. 1. Never go out by yourself in the summer heat. Ever. 2. If you break Rule One, tell the rangers where you’re going and when you expect to be back. That way they know where to look for the body. 3. Hydrate. Seems obvious? I mean REALLY hydrate. You can lose four liters of sweat per hour in Death Valley… consider that when you think how much water you need to take with you on a hike or run. 4. Wear white clothing (yes, I know) and long sleeves. Keep your face and head covered. 5. If you take prescription medication, be extra careful – many medications can be harmful in extreme heat. Check the warning label. 6. Have an exit strategy. This does not mean leaving your car if you should break down! In fact, the exit strategy for that situation is to STAY with your vehicle. The rangers will find you, because they’re very good at that sort of thing. 7. Carry extra water in your car, or on your person. Mistakes happen… this way you’re more likely to get a do-over.